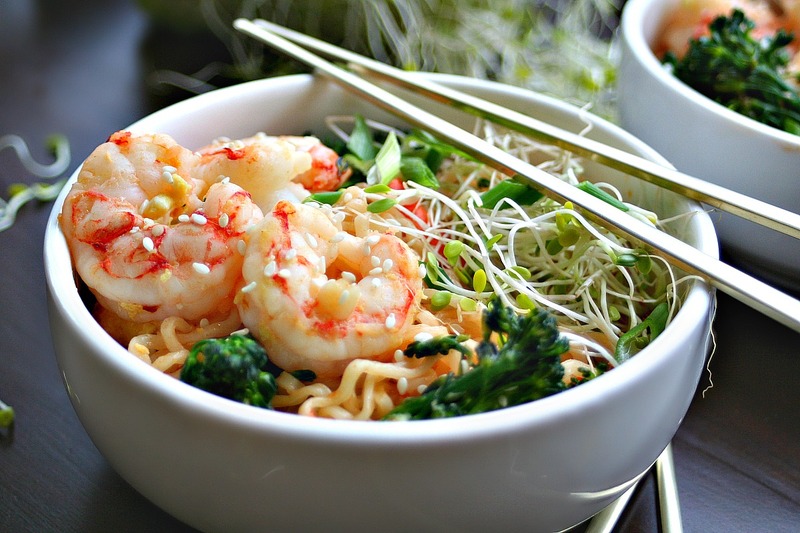 This Quick Sesame Shrimp Ramen Stir-fry could make for a very happy ‘Stir-Friday‘. There is a large collection of stir-fry recipes out there taking pride in being “take-out level”. Although this is definitely something to be excited about, I’m going to be completely honest and say that I’m content with the fact that this stir-fry does not qualify as “take-out level”. Now don’t get me wrong – I love me some good Westernized Chinese delivery. Nothing goes better with jogging pants and a lazy night than that. But sometimes I want a super quick and easy stir-fry that doesn’t make me feel like I’m 5 months pregnant with a food baby, you know? Sometimes I want to taste the shrimp in it’s shrimpy-ness; I want to taste the broccoli! That can be a challenge when everything is tossed and coated in gloopy sweet and sour sauces. In this dish, everything is identifiable. The tender shrimp, crunchy broccolini, egg, and sweet carrots are tossed in a light sesame and chili garlic blend, then topped with tangy scallions and fresh sprouts. Super de-lish, and mucho satisfactory! It’s also ready in 30 minutes or less. So, what’s the deal for this stir-friday? Take-out, or this bad boy? Cook the Ramen as per the packages directions. Drain, rinse, and set aside. In a small bowl, mix the 2 teaspoons of sesame oil, fish sauce, and sambal oelek. Set aside. When the skillet is hot, add 1 tablespoon sesame oil, garlic, carrots, and broccolini. Stir right away and care to not brown or burn the garlic. Sauté until the carrots and broccolini are tender enough to pierce with a fork, but still crisp (approx. 5 minutes). Add the shrimp and sauté until the shrimp is cooked through (approx. 2 minutes). With a spatula, move the vegetables and shrimps to the sides of the skillet and add the egg. Treat it like you would a scrambled egg, stirring it occasionally, until it breaks off into fluffy chunks (approx. 1-2 minutes). Toss the drained Ramen noodles into the skillet. Stir in the sesame sauce mixture and carefully toss until the noodles are coated and heated through. Taste, and if needed, add a bit more sesame oil and/or sambal oelek. Remove from heat, garnish with sliced scallions, sesame seeds, and sprouts. I just made this for dinner. It was delicious - the sauce mixture really makes it! I added baby bok choy and mushrooms too. I’ll be making this again ? Thanks so much, Sue! The colors and textures really get to shine since they aren't all slopped in sauce, haha. A nice change from the norm! This is my fav meal whenever I visit Korean restaurants and your bowl looks super scrumptious! I want to try this :). I hope you love it, Silvia!